THE ROAD TO FRANK GEHRY: WHAT HAPPENED AT LACMA? When The Simpsons make fun of your work, you have arrived, right? Many think of architecture as a final product, such as a building, a park or a piece of furniture. Many forget about the creative journey that arrives at the final product. Process and product—in life as in design, getting there is as gratifying as being there. I ask this of the Los Angeles County Museum of Art: why is the process that architect Frank Gehry is famously known for absent from your current exhibit? Simply entitled “Frank Gehry,” LACMA delivers their latest blockbuster show. Now in his late 80’s, Gehry’s career has been showered with every accolade, i.e. AIA Gold Medal, Pritzker Prize, and the National Medal of Arts awarded by the U.S. President. So why did the museum capture five decades of Gehry’s work by displaying only two aspects: early sketches (the beginning) followed by a large physical model (the conclusion)? Sure, there are other aspects in the show, like photographs and video clips. 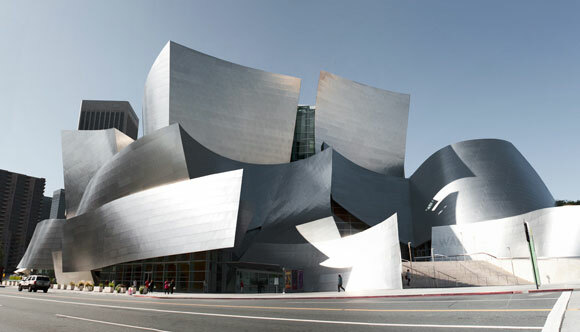 But where is the most fascinating aspect, Gehry’s artistic explorations? Well known for his ingenious studies—the process of drawing and drawing, building models of all sizes, variations and permutations, material and construction research, and innovative technological applications—these (samples below) are missing at LACMA. Here’s what I think. Over the years, Gehry’s imaginative process has been unfortunately labeled by the mainstream as “crumpled paper.” When this architect designs, his studies do look like crumpled pieces of paper. Dozens of them. Hundreds of them. Doomed, Gehry’s thoughtful research has been labeled not just formulaic, but cliché. Even my 10-year old daughter’s class studied his work, calling it crumpled wads of paper. As such, all the children giggle. To reach the height of pop-culture zeitgeist, for better or for worse, a 2012 episode of The Simpsons parodied Gehry’s designs. 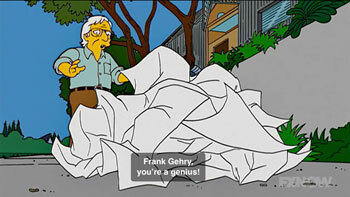 Fictionally, Marge’s crumpled letters inspired one of Gehry’s most prominent buildings, the Walt Disney Concert Hall. 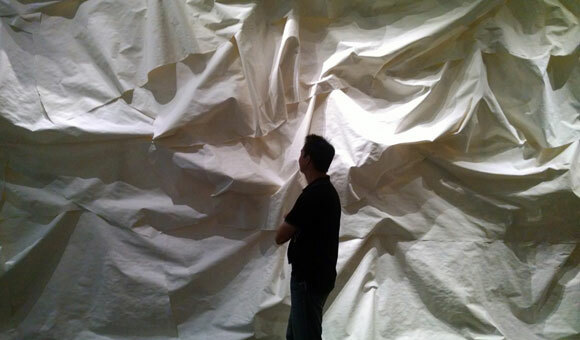 I believe LACMA, or even Gehry himself, chose to counter the ill-fated wrinkled paper theme. But by doing so, perhaps too much has been edited out. The previous exhibit at Bergamot Station in Santa Monica curated a much more revealing and exciting show, presenting Gehry’s inner workings and the in-betweens. Years back in Maui, I drove the legendary “Road to Hana.” When I arrived in Hana, I was dissatisfied by this small nondescript community. I then realized the point was not Hana itself, but rather, the road to Hana. I looked back at my delightful day—at how the 65-mile drive toured me through rain forests, waterfalls, beaches, bridges and the sunset. In architecture and in life: think process and product. Enjoy the trek and smell the roses.